It is with great pleasure that I say a few words about myself and my business, keeping in mind that I am here to serve you, as the piano owner, and your instrument. I think that you will agree: a well tuned piano, such as we hear on good quality CD’s, can be a real treat to the listener as well as the player by enhancing the beauty and richness of performance through perfect harmony and melody. Clarity of sound is the key to enjoyment and a piano, which is in tune, gives this. 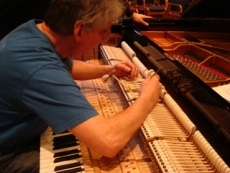 I have been tuning pianos for over 30 years on Vancouver Island and for The Banff Centre for the Arts for over 25 years. My training and experience have been with the best, both with other tuners and technicians as well as world renowned artists.